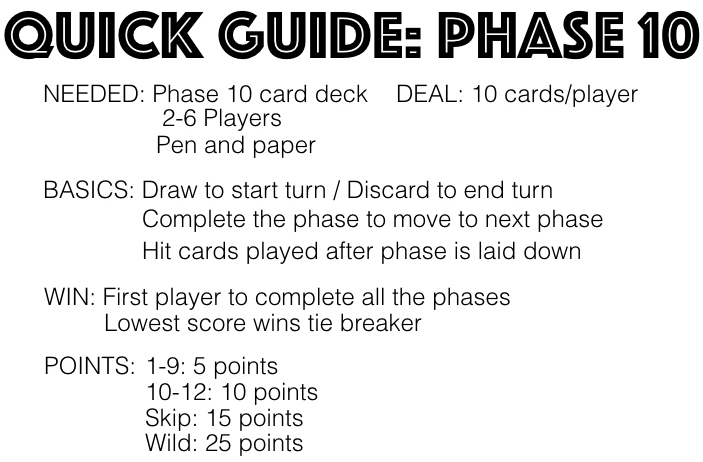 Phase 10 is a rummy style card game that is easy-to-play and can be enjoyed by 2-6 players. Be the first player through all 10 phases to win this game! The video tutorial and explanation are below. Deal: 10 cards to each player, 1 card at a time. Place the remaining deck (draw pile) in the middle and flip over the top card to start the discard pile. Objective: The object of the game is to be the first player to complete each of the 10 phases. To complete a phase, players will have to create certain card combinations including sets of cards with the same rank, runs of cards in sequential order, and cards of the same color. Wild Card - This card can be used as any number or color. Once laid on the table in a phase, the wild card cannot be moved. Skip - The player of a skip card will choose another player to lose his/her next turn. If a skip is the first card flipped up from the deck, the player left of the dealer is skipped. A skip card cannot be picked up from the discard pile. Game Play - The player left of the dealer plays first. Each turn begins by the player either drawing the top card on the draw pile or the top card of the discard pile. Each turn ends with a player discarding one of his/her cards. Play moves clockwise left. Once a player has a completed phase in his/her hand, the cards within the phase are laid down. Once a player completes a phase, he/she is able to play any leftover cards on any phase already laid down. This is known as hitting. A hit can only be made when the card fits into the phase. For example, adding a 5 to a set of 5s, adding a 5 to a run of 6, 7, 8, 9, or adding a blue card to a phase of blue cards. Once a player plays his/her last card, the round is over. Any player that completed a phase during the round will move to the next phase in the next round. Any player that did not complete his/her phase during the round will have to try for the same phase in the next round. Winning: The first player to complete all 10 phases wins the game. If 2 or more players finish the 10th phase in the same round, the winner is the player with the lowest score. Score: Players are given points based on the cards remaining in their hands once the round is over. Rule: If the draw pile runs out before a player ends the round, reshuffle the discard pile to make a new draw pile.